Shiny and new would be great, but they don’t stay that way for long and the depreciation is rapid and heavy. A used travel trailer or 5th wheel RV can save you a large percentage from the expense of buying new, while still providing you with a good alternative. Maybe your budget is more in line with a small weekend sized rig, but you really want roomy and spacious so you can live full-time at least part of the year on board. Whether on the road, or set up on a lake lot at an RV resort, you can get more bang for your buck if you consider a used RV trailer. Determining whether a particular RV trailer is a good investment or not is much easier than deciding if a motorhome is a good candidate or not. Without an engine and drive train to be concerned about, the chance of a major defect coming to light after the sale is much less likely with travel trailers and 5th wheels. Road safety should always be the first and most important concern when inspecting a used recreational vehicle. Be prepared to crawl under any RV trailer you’re considering in order to determine what condition the frame is in. A badly rusted frame indicates the foundation that supports your getaway structure isn’t sound and may give way at some time in the future. 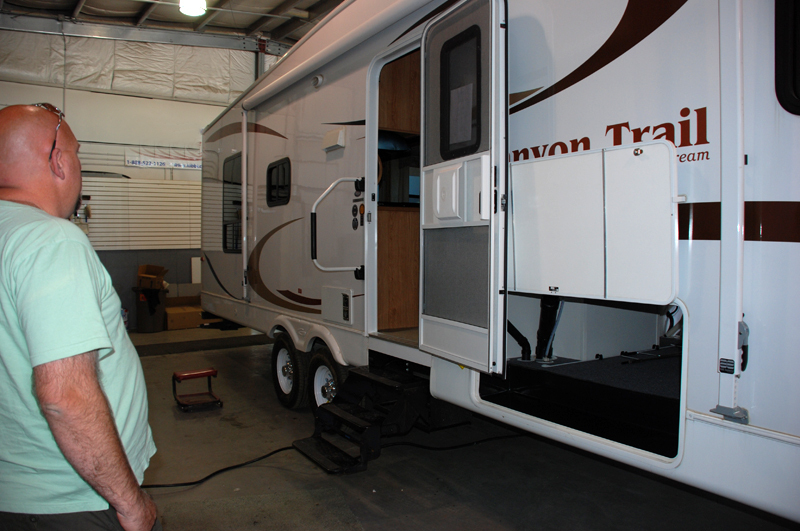 Cracks, broken welds, impact damage — all are reasons to move on to another used RV trailer. Tires, wheels and axles are your next concern. Unless the current owner can assure you that the tires are less than 5 years old (even if they look perfect or have hardly been driven), expect to replace them. Ultraviolet rays from the sun have created tire rot and tire failure is eminent. A blowout at highway speeds can be compounded by rapid failure of more than one tire at a time. It’s best to budget for tire replacement right from the start. Having the wheel bearings inspected and repacked, as well as the electric brake system checked, should be part of the first order of business when you take ownership of any used RV trailer. The good news is once you’ve reached this point, the trailer is mechanically safe to travel the road. 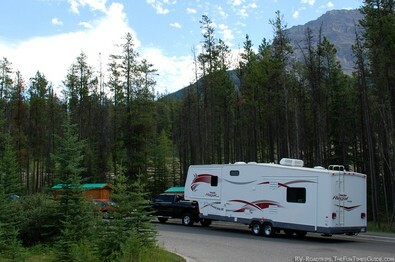 See… this process is much less complicated and less expensive than what is required when purchasing a used motorhome. A quick walk-through inside the trailer will identify structural problems. Are there leak stains on the ceilings? Are there any soft spots in the floor? Is the entry door working smoothly? Separation or peeling of the fiberglass side walls (an item too costly to repair). With aluminum siding, are there any loose panels, or physical damage? Damaged windows can be costly… Do they open properly? Is their mechanism in good operating condition? With all the structural issues confirmed to be okay, we move on to appliances and accessories. The most important would be the refrigerator. Large refrigerators can cost $2,000 or more. Repairs can be almost as expensive, quickly reaching the point where replacing it is more budget-friendly than repairing it. Always make sure the sale is pending verification that the refrigerator works properly. Lack of cooling isn’t the only concern. If the temperature regulation is not functioning, it will freeze your beer as well as your fruits and vegetables. The refrigerator is one of the most expensive features that could be considered a deal breaker, if not in good working order. The remaining appliances and fixtures will cost you hundreds — rather than thousands — to replace or repair. 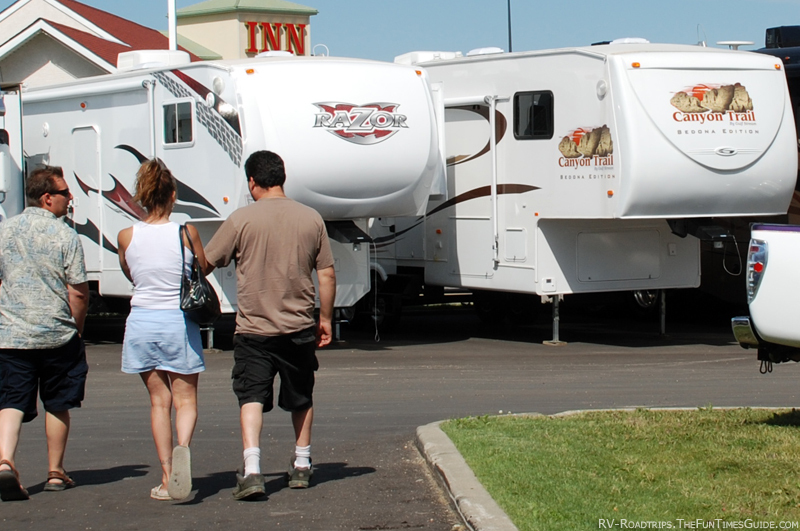 How picky you want to be depends on the RV’s overall condition and how good of a deal you’re able to make. Are the windows and curtains in good working order? This was the situation when we bought a 1995 35-foot fifth wheel to live in full time a couple of years ago… The interior was completely worn. 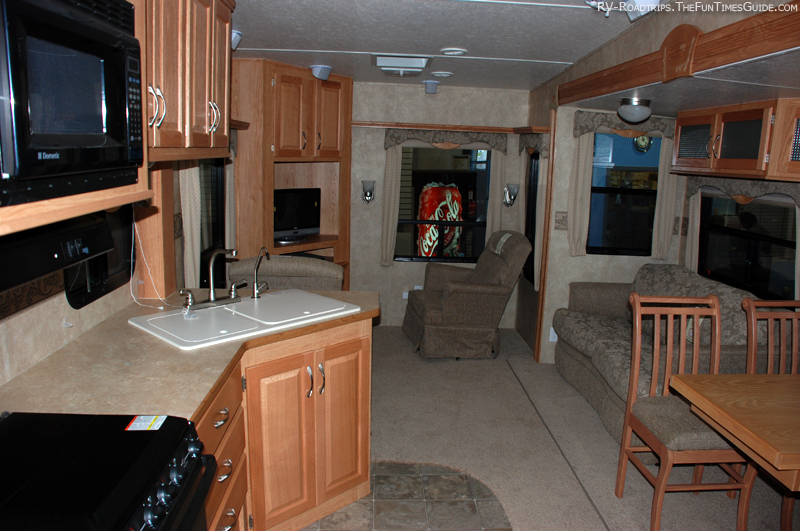 But you can completely remodel and freshen up the RV with new flooring, carpeting, and curtains throughout. We even went so far as to wallpaper some walls and paint others. We removed the dinette and did away with the built-in sofa. When we were done, we had a kitchen table and chairs for two, a new sofa, and we even found room for a small chest freezer. My wife loved it because now the 2 main floor slide-outs could be rearranged at will. Nothing was permanently mounted — giving us more of an apartment feel. 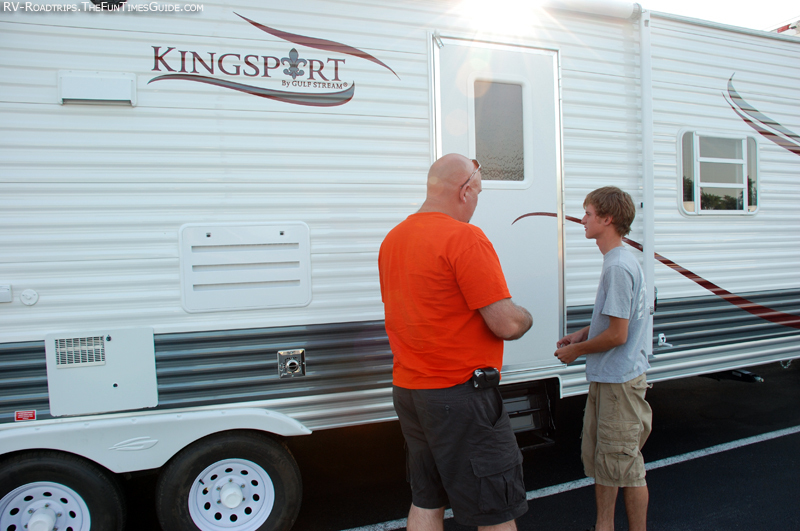 In the end, if you’re looking for the most square feet at the lowest cost, then buying a used RV trailer or fifth wheel trailer should definitely be a consideration. With a little work, you can make it your own. And in many ways, it will probably be better than what would find in a new RV!